The Hachidori Duo, featuring Jennifer Dalmas, violin, and Evgeni Raychev, cello, will perform at 7:30 p.m. Thursday, March 14, in Cole Concert Hall on the Stephen F. Austin State University campus. NACOGDOCHES, Texas - The Hachidori Duo will present "Musical Dialogues" when the husband-wife duo performs at 7:30 p.m. Thursday, March 14, in Cole Concert Hall on the Stephen F. Austin State University campus. The Hachidori Duo was founded in 1998 by Jennifer Dalmas, violin, and Evgeni Raychev, cello, while they were each pursuing doctoral degrees in music performance at Florida State University. 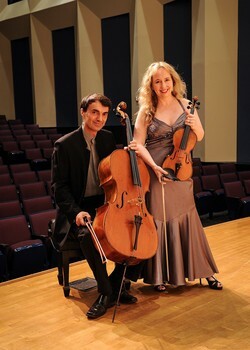 Since 2003, both performers have taught in the SFA School of Music. "'Hachidori' is the Japanese word for hummingbird," Dalmas said. "These incredible and beautiful creatures open our eyes to the beauty of the natural world. It is our hope that the music we perform will open a new world for our audience, as well." The program title "Musical Dialogues" was selected because much of the music has a "conversational give-and-take" aspect, according to Dalmas. Selections include "Two Duets" by J.S. Bach; Sonatine pour Violon et Violoncelle by Arthur Honegger; Duo No. 1 by Bohuslav Martinu; and Sonata pour Violon et Violoncelle by Maurice Ravel. "The Bach arrangements are re-workings of some of Bach's works for keyboard," Dalmas said. "The contrapuntal writing, or writing with two equal voices in mind, works very well for string duo. "The Martinu and Honegger duos are lesser known works for violin and cello, but both are wonderfully written compositions that contain lyrical, melodic slower sections and exciting, virtuosic fast movements," she said. The Ravel sonata is the best-known work for violin and cello on the program and was written almost 100 years ago, in 1920. "It is arguably one of Ravel's finest works, in which he shifts his focus from harmony to melody, and to dialogue between two voices," Dalmas said. The Hachidori Duo has given recitals and master classes in various countries in Europe and Central America as well as the United States and has also performed several double concertos with orchestra. The duo was featured at the National ASTA convention in 2009. Dalmas and Raychev frequently perform as part of educational programs, such as "Music in the Schools." In 2015, they served as music faculty at the Interharmony International Music Festival in Arcidosso, Italy. As part of the Interharmony chamber music concert series, the duo performed in the Weill Recital Hall at Carnegie Hall in 2016. The SFA concert is a joint presentation of the College of Fine Arts and School of Music. Tickets are $8 for adults, $6 for seniors and $3 for students and youth. For tickets or more information, call the SFA Fine Arts Box Office at (936) 468-6407 or visit www.finearts.sfasu.edu.